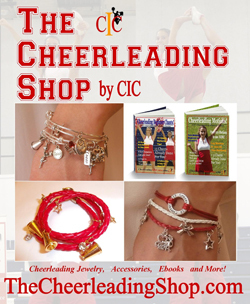 Are you looking for the most comprehensive Cheerleading Stunt information? Check out the Cheerleading Info Center Stunt Section for everything from Beginner to Advanced Stunts, Flyer Tips, Safety Tips, Base and Spotter Information and MORE! Have you ever wondered how to do a perfect Prep - also known as a Half Elevator? For all of the details, just click on Cheerleading Prep Stunt now. The Cradle Dismount is a very popular dismount for intermediate and advanced cheerleaders. It has many variations and can be done with the basic "pike" position or with a twist! For how to videos click on CRADLE DISMOUNT to get all of the info. Make sure the Flyer keeps her legs together and arms in a "T" motion. When the Flyer is caught by the bases, make sure she wraps her arms around the bases' shoulders. Make sure the Back Spotter catches the Flyer under her armpits. Do you want all of the tips and tricks to awesome cheerleading stunts and pyramids? Well our stunt section is loaded with tips, how to's, and videos. 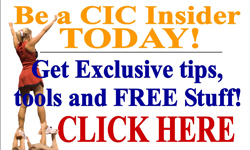 For all of the details, click CIC STUNT SECTION. 1. Never try any stunt you are not ready for. 2. Only stunt with an experienced coach. 3. Look around your area and make sure there are no hazards in your way. For example, if you are outside, make sure there are no rocks in your area and that you are on a flat surface. 4. Absolutely no laughing or fooling around during stunting. 5. Always have the proper safety equipment like proper sneakers and mats.